In recent years, there has been a trend in which data centers have been opting for commodity hardware and software over proprietary solutions. Why shouldn't they? It offers extremely low costs and the flexibility to build an ecosystem the way it is preferred. The only limitation is the extent of the administrator's imagination. However, a question needs to be asked: "How would such a customized solution compare to its proprietary and more costly counterpart?" Open-source projects have evolved and matured enough to stay competitive and provide the same feature-rich solutions that include volume management, data snapshots, data deduplication and so on. Although an often overlooked and longtime-supported concept is high availability. The idea behind high availability is simple: eliminate any single point of failure. This ensures that if a server node or a path to the underlying storage goes down (planned or unplanned), data requests still can be served. Now there are multiple layers to a storage-deployed solution that can be configured for high availability and that is why this article focuses strictly on HA-LVM. High Availability Logical Volume Manager (HA-LVM) is an add-on to the already integrated LVM suite. It enables a failover configuration for shared volumes—that is, if one server in a cluster fails or is taken down for maintenance, the shared storage configuration will fail over to the secondary server where all I/O requests will resume, uninterrupted. An HA-LVM configuration is an active/passive configuration. This means that a single server accesses the shared storage at any one time. In many cases, this is an ideal approach, as some of advanced LVM features, such as snapshot and data deduplication, are not supported in an active/active environment (when more than one server accesses the shared storage). A very important component to HA-LVM is the CLVM or Clustered LVM dæmon. When enabled, the CLVM dæmon prevents corruption of LVM metadata and its logical volumes, which occurs if multiple machines make overlapping changes. Although in an active/passive configuration, this becomes less of a concern. To accomplish this, the dæmon relies on a Distributed Lock Manager or DLM. The purpose of the DLM is to coordinate disk access for CLVM. The following example will cluster two servers that have access to the same external storage (Figure 1). This external storage could be a RAID-enabled or JBOD enclosure of disk drives, connected to the servers via a Fibre Channel, Serial Attached SCSI (SAS), iSCSI or other Storage Area Network (SAN) mapping. The configuration is storage protocol-agnostic and requires only that the clustered servers see the same shared block devices. CLVM is not compatible with MD RAID, as it does not support clusters yet. The CLVM dæmon distributes LVM metadata updates across the cluster, and it must be running on all nodes in that cluster. A JBOD (or Just a Bunch Of Disks) is an architecture using multiple hard drives, but not in a redundant configuration. Almost all Linux distributions offer the required packages. However, the names may differ in each. You need to install lvm2-cluster (in some distributions, the package may be named clvm), the Corosync cluster engine, the Red Hat cluster manager (or cman), the Resource Group manager dæmon (or rgmanager) and all their dependencies on all participating servers. Even though the Red Hat cluster manager contains the Linux distribution of the same name in its package description, most modern distributions unrelated to Red Hat will list it in their repositories. Note that the clusternode name is the server's hostname (change where necessary). Also, make sure the cluster.conf file is identical on all servers in the cluster. You now have a working cluster. The next step is to enable the Clustered LVM in High Availability mode. 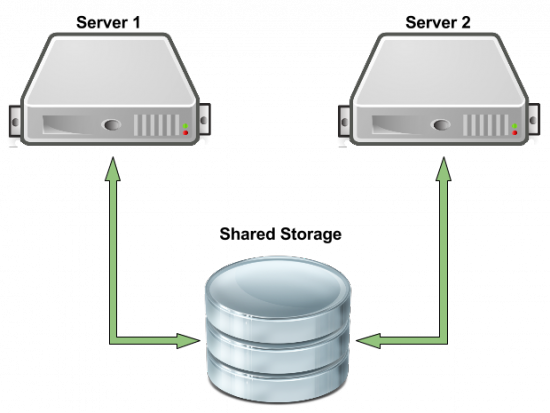 In this scenario, you have a single volume from the shared storage enclosure mapped to both servers. Both servers are able to observe and access this volume as /dev/sdb. # corruption if LVM2 commands get run concurrently). # Type 2 uses the external shared library locking_library. # Type 3 uses built-in clustered locking. # that might change metadata. The example above carves out a 50GB logical volume from the volume group and then formats it with an Extended 4 filesystem. The cy option used with the vgcreate (volume group create) command enables the volume group for clustered locking. The an option with the lvchange (logical volume change) command deactivates the logical volume. You will be relying on the CLVM and resource manager (read below) dæmons to handle activations based on the failover feature additions made in the same /etc/cluster/cluster.conf file created earlier. When active, the the shared volume will be accessible from /dev/shared_vg/ha_lv. The "rm" portion of the cluster.conf file utilizes the resource manager (or rgmanager). In this addition to the configuration file, you inform the cluster manager that serv-0001 should have ownership and sole access to the shared volume first. It will be mounted locally at the /mnt absolute path. If and when serv-0001 goes down for any reason, the resource manager then will perform a failover that will enable sole access to the shared volume, mounted at /mnt on serv-0002. All pending I/O requests sent to serv-0001 will resume on serv-0002. Assuming that no errors were observed, you now should have a running cluster configured in an active/passive configuration. You can validate this by checking the accessibility of the shared volume on all servers. It should be seen, enabled and mounted on serv-0001 and not on serv-0002. Now comes the moment of truth—that is, testing the failover. Manually power down serv-0001. You will notice the rgmanager kicking in and enabling/mounting the volume on serv-0002. To enable these services automatically on reboot, use chkconfig to start the services on all appropriate runlevels. The primary objective of HA-LVM is to provide the data center with enterprise-class fault tolerance at a fraction of the price. No one ever wants to experience server downtimes, and with an appropriate configuration, no one has to. From the data center to your home office, this solution can be deployed almost anywhere.